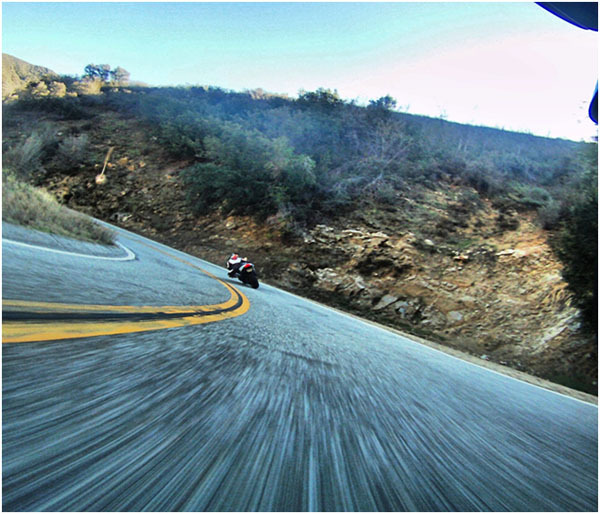 Just some of the words used by motorcycle enthusiasts describing the infamous Glendora Mountain Road. Fourty miles north of Orange and nestled above the city of Azusa, GMR is armed with blind turns, switchbacks, and hairpins so tight you can hardly breathe. It’s not the cleanest of roads either. Decorated with tar snakes, gravel and dips big enough to make your heart sink, you really have to develop a Jedi like focus to ride the road. It’s not uncommon to see a tow truck hauling away pieces of motorcycle wreckage. 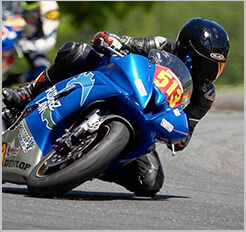 This is one road amateur and intermediate motorcycle riders should consider taking slower than normal. For a select few this rollercoaster canyon is home, and has earned the right to be renamed Glendora Mountain Raceway by the bravest of riders. The above photograph was taken by me while following my buddy down the canyon at nearly full lean, just inches from kissing the pavement. As avid riders we love testing the limits of our chariots to the max. Putting our bodies and our minds through the rigors of such an advanced canyon, we push ourselves to overcome it and achieve greatness. Yes it’s dangerous and sometimes outright crazy to tackle such a technical canyon, but to us it’s utter bliss. It’s an escape from our everyday lives. It’s an opportunity to hang up our ties and forget about the 9 to 5 job, eagerly zooming out of the city. GMR has attracted riders from all over Southern California bringing together new meetings and friendships. It brings together different styles and levels of riders searching for what is without a doubt one of the most challenging canyons in Socal. We come to put our skills against the mountain. We know the risks, but to us canyon riders, it’s the happiest place on earth.